Malwarebytes is a software service that offers security against malware, ransomware, threats and infected sites. It is a recognized name in anti-malware solutions, the technology contains several interesting protection modules. Aside from these key features, Malwarebytes’ latest version includes a scan scheduler that can perform comprehensive scans even when owners are not using their computers. The software also has the ability to shield itself from unwanted modifications. The tools of Malwarebytes can be accessed easily navigating the software’s intuitive interface. The main screen showcases all the active features, the status of a scan, and the device’s protection history. This means that user can easily distinguish the possible issues of a device with just one review. The user-friendly interface also displays the quantity of scanned items, the number of compromised files, and the latest update. 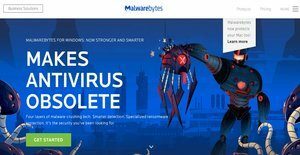 Malwarebytes shields users from advanced threats by detecting and removing viruses in real-time. This is done with the use of advanced anti-malware, anti-spyware, and anti-rootkit technology. The software’s auto-scan feature also offers a proactive way to clean up a system. The state-of-the-art tools of Malwarebytes can prevent files from being locked and taken for ransom. Both unknown and known ransomware can be taken down using comprehensive defense features that protect better than just basic decryption tools. Users can avoid having their programs used against them with the help of Malwarebytes’ four layers of defense. These can wrap browser and software programs so that infectious attacks be avoided. Malwarebytes provides protection from fake and infected websites. Given the alarming rise of these pages all over the net, users can be more at ease about surfing online as the software warns whenever there are malware downloads, hacking attempts, and contaminated advertisements. Scans can be much quicker and efficient with the help of Malwarebytes’ Hyper Scan mode. The rapid inspection targets active threats and provides faster analysis. Users can even perform scans while running other tasks. Since Malwarebytes offers four different layers of defense that handles virus detection, protection, and removal. This means that users no longer need to bulk up on separate antivirus services. Each business has its own characteristics, and can need a special IT Management Software solution that will be adjusted to their company size, type of customers and staff and even specific industry they deal with. You should not count on locating a perfect software that will be suitable for every company regardless of their history is. It may be a good idea to read a few Malwarebytes reviews first and even then you should remember what the service is supposed to do for your company and your workers. Do you require a simple and intuitive solution with only essential features? Will you actually make use of the advanced tools needed by pros and big enterprises? Are there any specific features that are especially beneficial for the industry you work in? If you ask yourself these questions it is going to be much easier to find a trustworthy service that will fit your budget. How Much Does Malwarebytes Cost? We realize that when you make a decision to buy IT Security Software it’s important not only to see how experts evaluate it in their reviews, but also to find out if the real people and companies that buy it are actually satisfied with the product. That’s why we’ve created our behavior-based Customer Satisfaction Algorithm™ that gathers customer reviews, comments and Malwarebytes reviews across a wide range of social media sites. The data is then presented in an easy to digest form showing how many people had positive and negative experience with Malwarebytes. With that information at hand you should be equipped to make an informed buying decision that you won’t regret. What are Malwarebytes pricing details? What integrations are available for Malwarebytes? If you need more information about Malwarebytes or you simply have a question let us know what you need and we’ll forward your request directly to the vendor.